Comfortable light green shades, wooden furniture and quotes dotted on the walls – I was already sensing that this would be a cafe worth writing about when I saw the entrance. Of course the “healthy” concept was the selling point which attracted me here in the first place, but it’s the, I would say “realistically healthy” or “sustainably healthy” food, that left me impressed in the end. What I mean is that, they don’t exactly serve organic-only food, nor do they focus on superfood salads, raw diets or any of those detox fads that have become so popular in magazines and the internet these days. They added a bit of imagination to real food, and made sure every meal is nutritious. And the food was delicious. 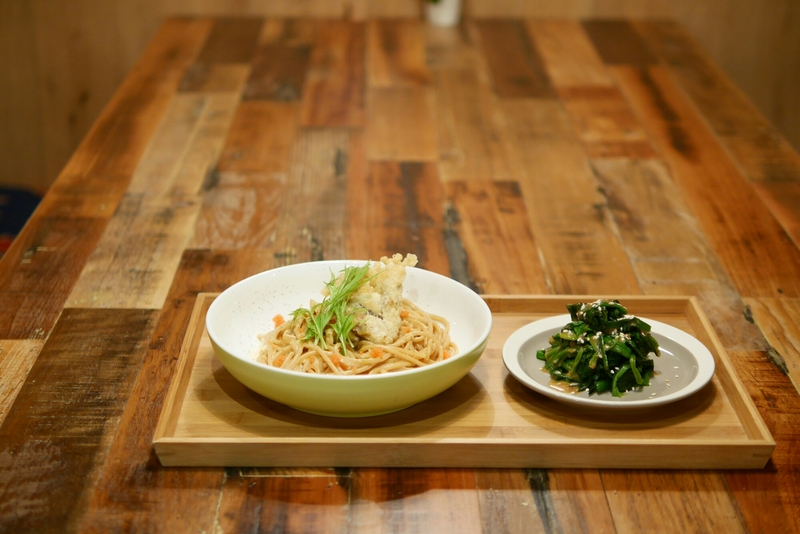 Set lunch is served from 11:00am-2:30pm and includes an appetiser, main course, quinoa & red rice and hojicha. The price tag of HK$100-140 is definitely not super appealing, but for the quality and taste of the food, this would definitely be my regular lunch spot if I worked near Taikoo. The tofu coconut was the most unsuspectingly yummy dish I tasted at Cafe Greenprint. 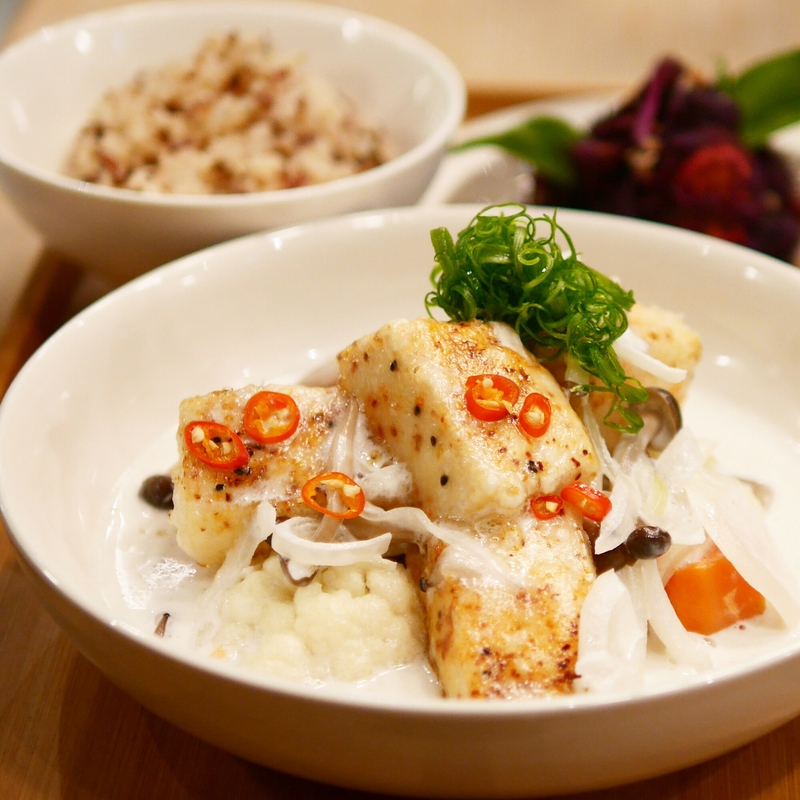 There were a few sizable chunks of super silky smooth tofu, coated with a nice soft layer, served in a creamy coconut sauce. It was also a tad spicy. I’ve never tasted this combo before, but it’s definitely not one I’ll be forgetting about soon. It’s HIGHLY recommended! Although the beef roll was not too inventive or surprising, it was still cooked very well and it’s one of the few lunch set options that would satisfy a meat-hungry person. They’re OK generous with the meat, but super generous with the asparagus… making sure you get a lot of fibre. That brings me to an important point: this cafe tries to encourage a more nutritious meal. Let’s face it, there are many days we just don’t feel like eating a salad or that side plate of broccoli. But you know the consequences of a lack of fibre is agitating and totally avoidable. To increase the fibre content of your meal, they mix in red rice and quinoa into the bowl of rice which accompanies your meal. They also serve a lot of fibre rich side dishes: the blue potato and maple pumpkin were my favourites. They make minor switches like using wheat spaghetti instead of white – although the uni pasta made with wheat spaghetti was only so-so. The set dinner menu is also similar, except with a different variety of dishes, served from 6:00pm to 9:30pm. The Sole Lasagne was probably the highlight. 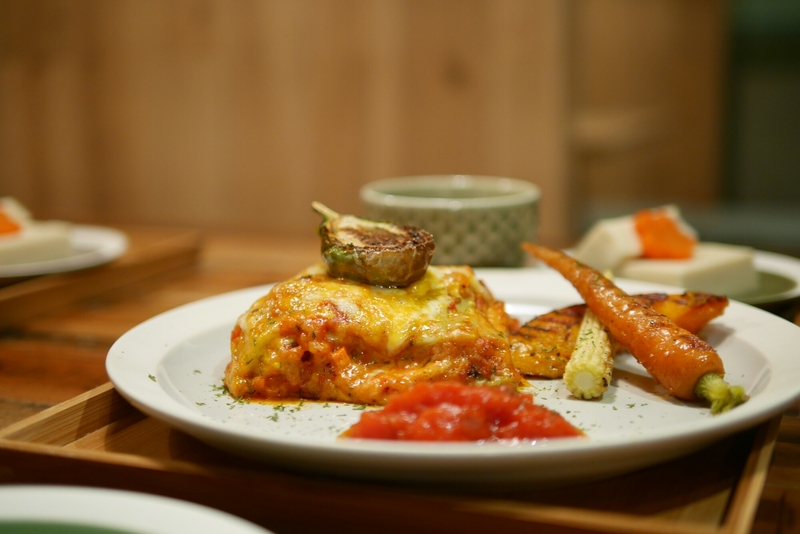 It’s made with spinach pasta sheets, layered with fish and smothered with a refreshing tomato sauce. It was super tasty and satisfying, although not as cheesily filling as the typical lasagne (I approve!). I know “zoodles” are a thang right now and they do sometimes taste good. The zucchini noodles here mimics a tomato sauce pasta but I thought it was a bit too veggie-intense. I suppose it’s a good choice for those who are looking for a healthy-healthy meal. A picture says a thousand words. I had my eye on this item as soon as I opened the menu. Not all “raw cacao” desserts are good but you really could not tell that this chocolate cake was a healthy version. Ok, to be fair, I don’t really know if the cake is healthy at all – it’s probably not. They say it’s made with sin-free sugar and although I believe natural sugars are better than processed refined ones, sugar is still sugar and too much sugar is still not good for you. 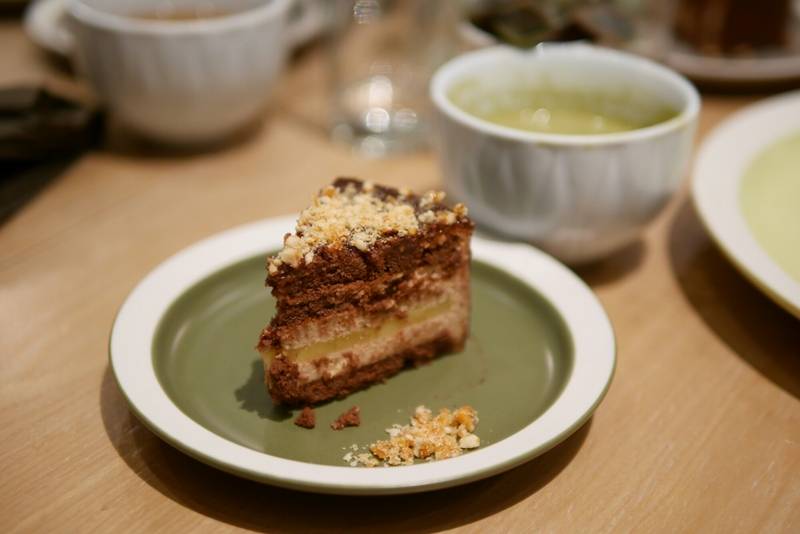 Good news is, even if it was a totally sinful dessert, this cake is still a MUST order. There are a lot of must order labels in this post, but for all ginger lovers, you can’t let yourself go before you order the ginger matcha latte. It was super gingery, yet still quite matcha-y. Knowing that meals are nutritious is often good enough for me, when it comes to maintaining a healthy (ish) diet. I feel pretty guilty when I eat a huge meal of deliciousness, only to remember that I was consuming 99.9% carbohydrates – that won’t happen here. I suppose my only tiny complaint would be the prices. 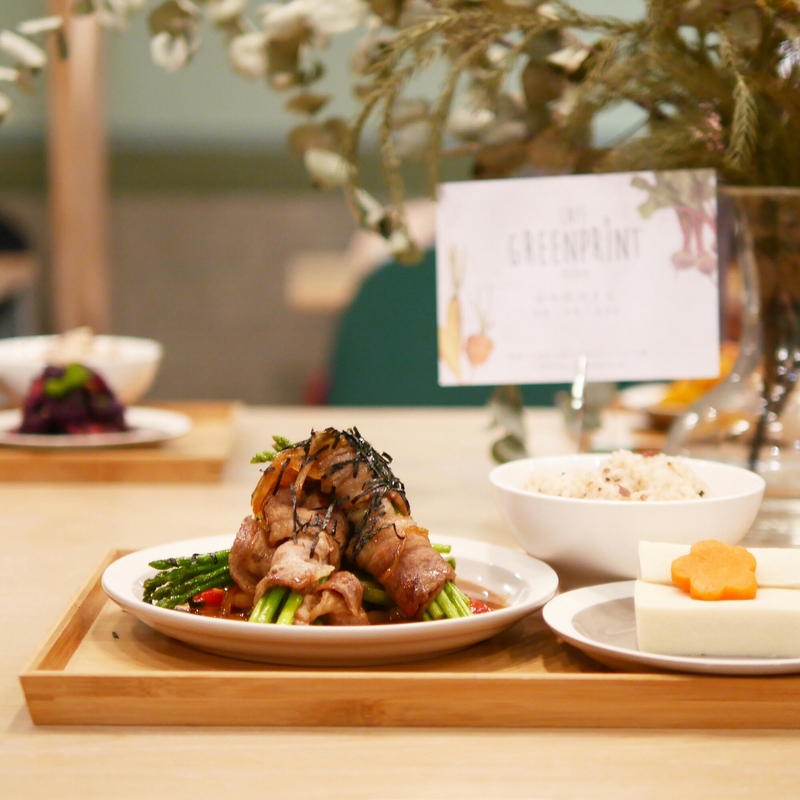 You can expect to spend about HK$150 for lunch and HK$200+ for dinner, especially if you’re adding on desserts or drinks. I personally think it’s a very reasonable price for what you’re getting, but I suppose it does make you think twice about whether you really want that extra ginger matcha latte (priced at HK$43). How do you stay healthy? I try to Make Healthy Mondays a Habit, but apart from that, I’d love to hear new ideas!